Systems Thinking, Systems Practice "Whether by design, accident or merely synchronicity, Checkland appears to have developed a habit of writing seminal publications near the start of each decade which establish the basis and framework for systems methodology research for that decade." Hamish Rennie, Journal of the Operational Research Society, 1992 Thirty years ago Peter Checkland set out to test whether the Systems Engineering (SE) approach, highly successful in technical problems, could be used by managers coping with the unfolding complexities of organizational life. The straightforward transfer of SE to the broader situations of management was not possible, but by insisting on a combination of systems thinking strongly linked to real--world practice Checkland and his collaborators developed an alternative approach -- Soft Systems Methodology (SSM) -- which enables managers of all kinds and at any level to deal with the subtleties and confusions of the situations they face. This work established the now accepted distinction between a harda systems thinking, in which parts of the world are taken to be a systemsa which can be a engineereda , and a softa systems thinking in which the focus is on making sure the process of inquiry into real--world complexity is itself a system for learning. Systems Thinking, Systems Practice (1981) and Soft Systems Methodology in Action (1990) together with an earlier paper Towards a Systems--based Methodology for Real--World Problem Solving (1972) have long been recognized as classics in the field. Now Peter Checkland has looked back over the three decades of SSM development, brought the account of it up to date, and reflected on the whole evolutionary process which has produced a mature SSM. 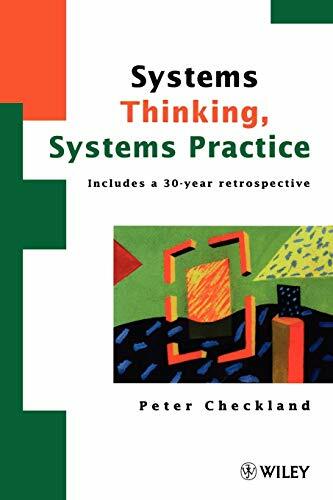 SSM: A 30--Year Retrospective, here included with Systems Thinking, Systems Practice closes a chapter on what is undoubtedly the most significant single research programme on the use of systems ideas in problem solving. Now retired from full--time university work, Peter Checkland continues his research as a Leverhulme Emeritus Fellow.